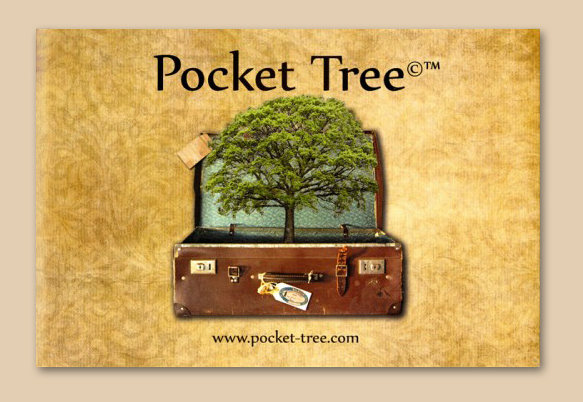 A few weeks ago I saw a product review of Pocket Tree on the We Tree blog. I was immediately interested in this product, although not only from the research tool perspective that it was initially designed for. Pocket Tree is a compact, 6-3/4" x 4-1/2", ancestry chart that when unfolded extends to 26-1/2" x 8-3/4"! The Pocket Tree will hold 9+ generations worth of information that you can view at a glance. This is a lightweight, portable research tool that is easy to use in a library, courthouse or other repository. 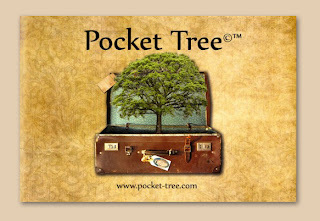 With the small size of Pocket Tree you can keep it with you at all times in a purse, glove box or, yes, even a pocket. Once received, I was immediately impressed with the quality of Pocket Tree. The front and back covers are sturdy with a beautiful heritage feel and a cleverly designed graphic. It is a visually appealing item. "Pocket Tree's ©™ cover is of high quality construction printed on a 12 point C1S Sheet, varnish-coated. Varnishing a product allows temporary water resistance, and won't show fingerprints. It aids to the longevity and sturdiness of the product." While I fully appreciate the usefulness of Pocket Tree as a research tool, my immediate reaction was that I would use this as a sharing tool. Pocket Tree will easily fit into a Christmas or Birthday card. What a wonderful way to share your research findings with others in your family. You may be lucky to have family members that want to see the pages after pages of research you have accumulated. However, in my family, the opposite tends to be the norm. Names, places and dates are the extent of the information many of my family members want to be faced with. Pocket Tree is perfect for that. I am looking forward to sharing my family history information through the Pocket Tree. Perhaps receiving a gift such as this will be all that's needed to ignite the interest of others to search for their ancestors. Thanks for the mention. My dad ended up buying a bunch for our family. He asked me to fill them out and we'll give them to family members so they know a little about our history. My dad also wanted one so he could have a little research tool when he is out and about. This made me happy because it's the most enthusiastic I've seen him about genealogy. This looks like a handy tool, esp. for the non-tech savvy. Amy's dad has the right idea passing them out to the family! As soon as I saw this on Amy's blog I loved it. I am a techie and like all my gadgets, but when I think "heritage" I think paper, something I can hold. These Pocket Tree's are going to become a standard family baby gift from Aunt Jenna. If all they do is put it in the baby book, that's fine. Someday someone will find it and appreciate it...I hope!